I must leave off for the night, the Rain has filled the house with insects, I am covered with them and with grasshoppers of all sizes and colours which are swarming over my paper, hopping on my pen, filling my nose and eyes, worrying in my hair and whiskers […] the insects get into the inkpot and cause you to blot your paper when they are brought out impaled on the end of your pen. History delights in the near miss—the manuscript decaying in the attic, rejected by its author is later published and held to be a work of genius. Negligent executors famously ignore the author’s final wishes. The publication of Virgil’s Aeneid is perhaps the most well-known example of the cultural benefits of author betrayal. The fact is, no one can control their writing after death. We keep our journals. We write down words; trace our days and mark time. Like photography, or taxidermy, we attempt to preserve something for later. We can never know who in the future might read us … if we will be read at all. If we could imagine an ideal reader—it would have to be Jenny Balfour Paul. A woman who not only read the journals of Thomas Machell (written between 1840 and 1862) but who retraced his journeys, visited his childhood home, located his grave, connected with his descendants, and imagined the details of his life with clarity and great sympathy. No, indeed, went further than this: fell in love with him, defended him, championed him … and in a strange way became him. 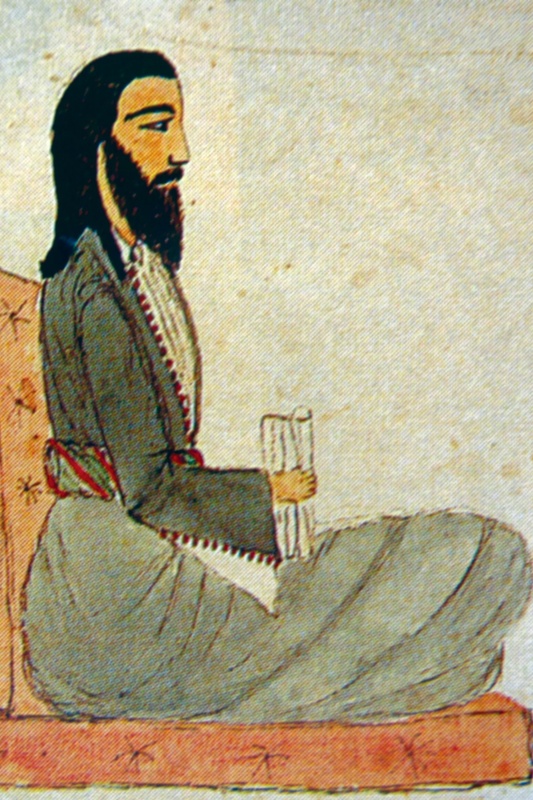 Text and illustration from the 1847 journal that records Machell’s arrival in Muscat, Oman. British Library. Jenny Balfour Paul is recognized internationally as a leading authority on indigo. Her doctoral thesis, Indigo in the Arab World, recorded traditions that had almost completely vanished (in 1983, the year of her first visit to Zabid, Yemen, indigo studios had dwindled from over one hundred in the 1960s to only two). She popularized this famous blue dyestuff with her book Indigo, (first published by the British Museum in 1998) a work that set the benchmark not only for craft research but also for engaging writing. The book is complemented by excellent photography much of it taken by Balfour Paul herself on location throughout the world. Jenny is voraciously curious. When I first met her it was the quality that most impressed me. Highly intelligent with a precise memory and the ability to piece together disparate bits of information, Jenny’s questioning is almost predatory. One feels that in different circumstances detective work might have been her calling. Already thoroughly immersed in the history and culture of indigo, when she was led to the journals of Thomas Machell the inevitable happened, she began to investigate him and reconstruct his life. Originally she only wanted to publish an edited version of his journals, but her own explorations combined with an uncanny set of coincidences led to the present work. 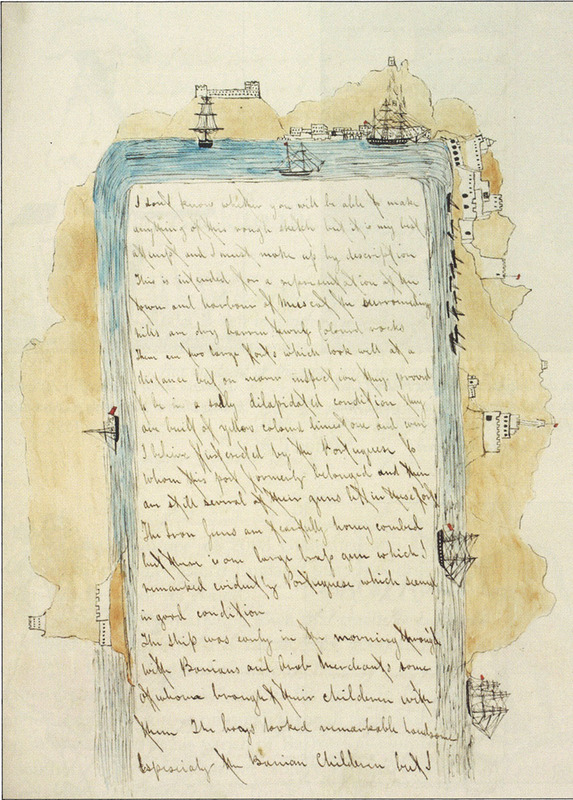 A page from Machell’s journal with text and an illustration of the Baghlah, a large deep-sea dhow. British Library. Thomas Machell’s personality drew her in. He seduced her from a century and a half away. He was observant, articulate, and possessed a gift for compelling prose. A disability kept him out of the Army and gave him empathy for the cultures that his compatriots were colonizing. He was an eyewitness to the first Opium War as the East Indiaman in which he served, the Worester, was commissioned to bring troops and supplies to Hong Kong. Thomas Machell was at times a sailor, a Bengal indigo planter, a Kerala coffee planter, tutor, a professional writer, and more; but he was above all, an adventurer. I felt as if all I saw must be a fantastic dream, but was roused from my trance by the touch of a delicate brown hand on my sleeve, and raising my eyes from the decks I encountered the laughing gaze of a pair of brilliant dark eyes whose glance darted through my whole frame like an electric shock. “Ti ho,” said the little Gypsy laughing in my troubled face, “Ti ho Whyheva moutakee?” And again laid her delicate tattooed hand on my arm. What could I do? From that moment I was the slave of the dark eyed Whyheva, daughter of a savage Chief. Thomas illustrated his Journals with drawings and water colour paintings. The works have a delightfully innocent, folk-art style. They take the reader immediately into Thomas’ world in a way that would be difficult using a more polished technique. On more than one occasion the drawings guide Balfour Paul in her search for Thomas’ Bengal (and now Bangladesh) plantation houses. 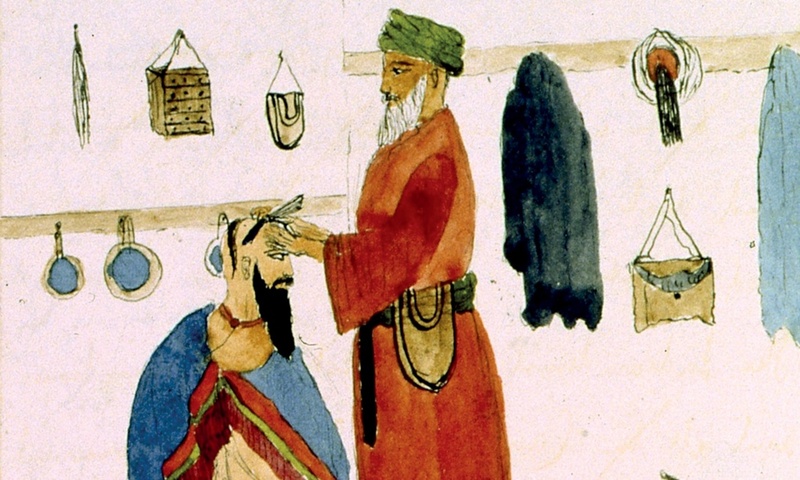 Machell visits the town barber of Suez. British Library. 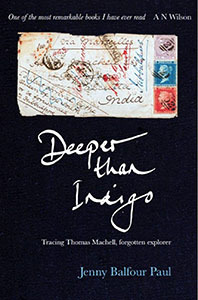 As rich as it is, Thomas’ life is only half the tale of Deeper than Indigo. The second half, the mirror image, the echo, will be Jenny’s tale. Taken together they are anima and animus (to use the entirely appropriate Jungian terms for gendered complementary elements). An intrepid traveler herself, Jenny will be the equal of her muse in exploration, journal keeping, and illustration. For example, in 2010 Balfour Paul will book passage on the freighter CMA-CGM’s Coral—the last freighter to take passengers from the UK to India. Like Thomas before her, the four-month journey will take her through pirate-infested waters. 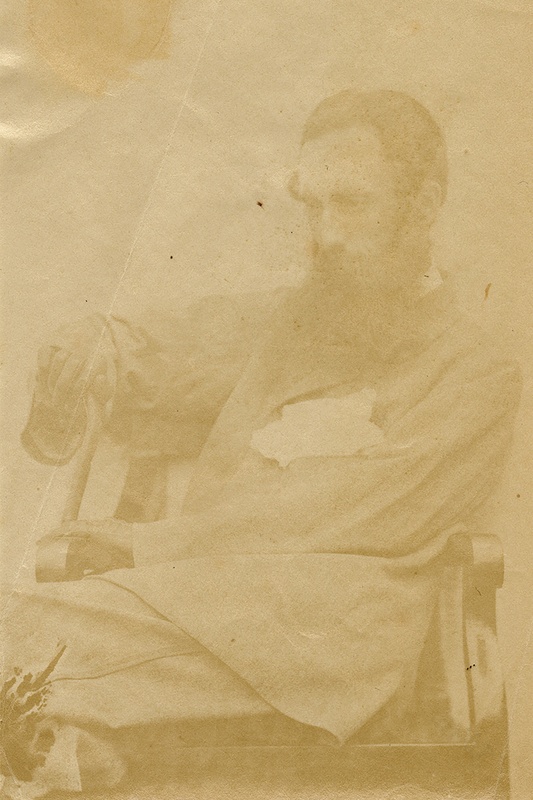 The only photograph of Thomas Machell, taken in 1862, the last year of his life. When Jenny takes her adult daughter Finella to Madhya Pradesh to find Thomas’s grave, elements of life and biography merge into accomplished travel writing. The search has great purpose, yet is frustrated by petty officials, road works, and inevitable temple visits. Through all this Finella provides wry asides to counter the desperate search. The results are witty, humorous, and thoroughly engaging. Deeper than Indigo is a unique work. It is part biography, part autobiography, part history, part genealogy, part travel writing, and part fiction. 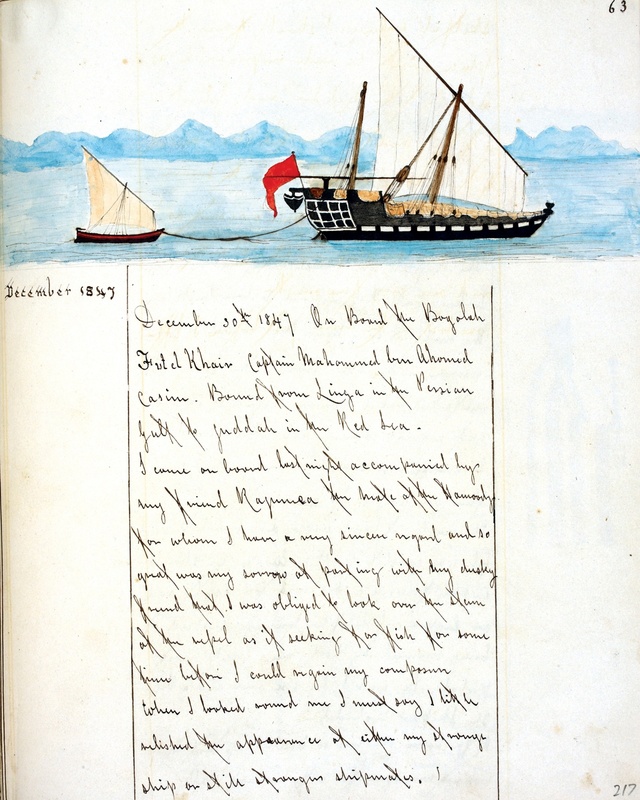 Balfour Paul writes the text to complete the last two of Thomas’ missing journals; an act that permits her to include the first Sepoy Uprising of 1857 (also know as the Indian Mutiny) and the subsequent Blue Mutiny in Bengal (British coercion had already let to widespread famine in the area). These were perhaps the most important events of the century for Anglo-India relations and as a former Indigo planter, Thomas would have been at the centre of them. Deeper than Indigo may hint at comparison to W.G. Sebald’s The Rings of Saturn. Both Sebald and Balfour Paul combine an inner dialog formed while travelling with expansive historical excursions. Both works, for example, visit the first Opium Wars, and both works follow writers (for Sebald it is Joseph Conrad, for Balfour Paul it is Thomas Machell) and are brought up against the colonial enterprise. But while Sebald’s voice is thoroughly steeped in an exacting melancholy (and just as exacting sentence structure), Balfour Pauls is pellucid—with great veracity but also with a conversational lightness and occasional bathos. Deeper than Indigo is ultimately a heroic undertaking—both in the lives of its protagonists and in the composition of it pages. It explores many lives and organizes them into a universe of connection. Using poetry, quotes, maps, family trees, illustrations, paintings, photographs, Deeper than Indigo is a symphony of a book. It is a work that vividly evokes a time now lost, and yet clears a window to show how the past is always directing the present. In its investigations it has gone further than most dare go. It has plumbed strange depths that are indeed, deeper than indigo. Copies are available in the Maiwa Handprints Bookstore.